It’s something I’ve written about before, but even so, I adore Japanese food. Over the past ten years, the UK has become far more accustomed to the land of the rising sun’s national cuisine. And with so many specialist restaurants constantly opening across London, I couldn’t be happier. There’s just something so heart warming about giant bowls of ramen noodles in silky bone broth, demanding to be slurped; slivers of fresh raw fish; dominoes of sticky rice laced with sugar and vinegar, topped with all sorts of marvellous creatures; and genuine wasabi that’s not just green-dyed horseradish squeezed from a toothpaste tube. All of this is, of course, best washed down with buckets of clean, refreshing sake served ice-cold or lukewarm. So when news broke that Sakagura would be opening at the end of last year by The Japan Centre Group, I could barely contain my excitement. For quite possibly the first time in my life, I arrive early for our reservation and perch at the bar, waiting for my friend to arrive. As expected from a restaurant that takes its name from the Japanese term for ‘Sake Cellar’, the bar here is impressive. Stretched across the whole far-side of the dimly-lit ground-floor typically furnished with light, bare wood and a trellised ceiling, this bar has an impressive repertoire of spirits, including some Japanese whisky rarities. Downstairs, a sake cellar is stocked with a wide range of premium sakes from Gekkeikan – one of the oldest sake companies in the world – amongst a selection from other sakes sourced from a number of local producers across Japan. In keeping with the extensive spirits selection, the upstairs bar has a vast cocktail list. My friend orders one of the braver combinations, teaming Japanese whisky with jalapeños, while my ‘Hibiki Moyasu’ makes great use of Suntory’s Hibiki Harmony – an un-aged expression that’s otherwise considerably less exciting than the 12-year-old expression. The drink is poured into the glass over a cricket ball of carved ice, and is served on a slate – somewhat unnecessarily. Regardless, the drink has a well-judged balance of smoke and richness in harmony with the oil from some orange rind. Shortly after taking our seats, we’re presented with a Bento box-like contraption filled with mismatched sake glasses, from which we’re instructed to choose one to use. These are quickly filled with Gekkeikan “denshou”, posing notes of melon and lychee. As for the food, there’s a prominent focus on authentic Japanese washoku, covering all five flavours (sweetness, sourness, saltiness, bitterness and umami) while striving to stimulate all senses. We begin with a titanic vessel filled with crushed ice and topped with chunks of various sashimi. The fish is very good, particularly the marbled slices of tuna. What’s more, all is served at body temperature and has been precisely sliced with a knife as sharp as AA Gill’s tongue. But the garnish, with a wall of twigs and excessive foliage, makes the dish look like a buffet centre piece at one of the Red Sea resorts that taste forgot. Another starter of tuna tartare is also garishly dressed and served in a fisherman’s tray. Fortunately, the main part of the dish is remarkable. Fatty tuna belly is finely chopped and pressed into a slab of tartare, separated by an ebony division of fish roe. On the side, a conical mound of wasabi has the vibrancy of a STABILO highlighter with a taste explosion that stabs through the fish’s fattiness. A signature dish of flamed mackerel is less of a ceviche than a selection of six maki rolls. We both agree, it’s the best thing eaten at Sakagura. Slivers of powerful mackerel top mounds of almost unnecessary sticky rice, slightly singed to add a hint of smokiness, counteracting some of the oiliness. A substantial pot of chicken and burdock Kamameshi rice is also pleasing, mixed and served table-side. Cooking rice this way leads to the iron pan intentionally burning the bottom layer, lending outstanding depth of flavour. The lobster main – with lime and without claws – closely resembles an armoured langoustine, and is cooked to such a degree that the tail is it’s almost inedibly tough. Far better is a slab of wagyu beef sirloin, sliced against the grain and cooked to a perfect medium-rare. This is steak as it should be, without unnecessary sauce, aggressive seasoning or perfunctory accompaniments. We finish with a matcha fondant that’s more of a brownie, as barely any molten centre flows when cut into. (For what it’s worth, a friend visited the restaurant last week and his matcha fondant was well-executed). Raindrop cake, on the other hand, features two breasts of agar umeshu jelly, lacking enough flavour to justify the frankly incongruous texture. Through its few culinary shortcomings, its clear that all of the meat and fish that passes through the kitchen of Sakagura is of an exceptional quality. Visit after a shopping expedition on hectic Regent Street, for instance, and it will be virtually impossible to leave without feeling refreshed. 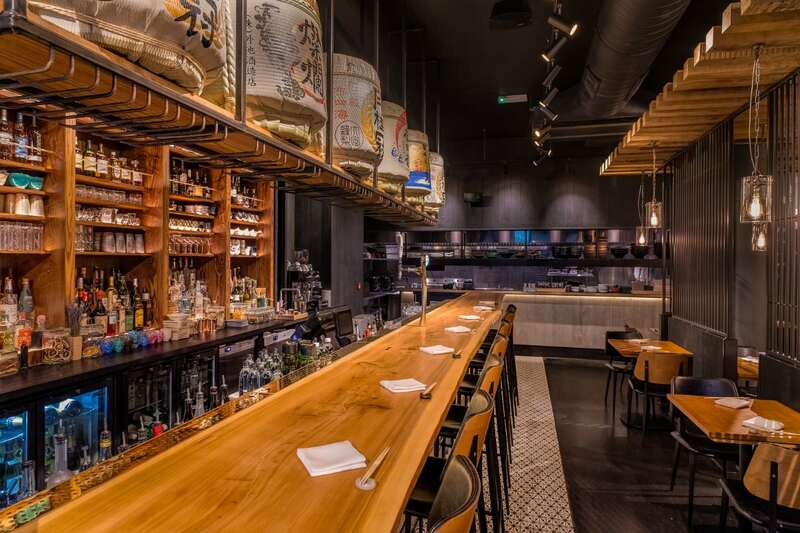 Conversely, Sakagura is not the best Japanese restaurant in Mayfair, but it’s a welcome addition to Heddon Street and London’s growing repertoire of Japanese restaurants. Sakagura can be found at 8 Heddon Street, London W1B 4BU.